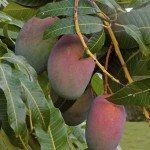 I want to know the standard amount of fertilizer to apply on mango and pineapple plantations in order to meet the EU export standard. Here are some links that will help you with fertilizing information. We would suggest you contact your government offices to receive information on export laws on commodities.